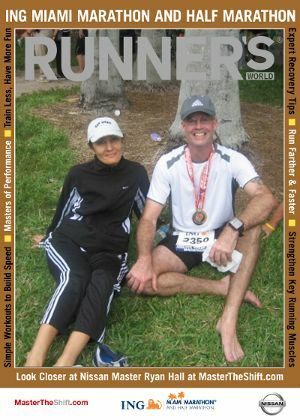 Above is a picture of my wife Tanya and me after completing our races. She also completed the half marathon in a stunning 2:10:48 making me so proud of her accomplishment. She has been running for about a year, but has trained very hard for the past 10 weeks specifically for the half marathon. It has been an exciting time, and has brought us closer together in the process as we shared in the daily learning and struggles along the way. It has been 8 weeks since I ran my first marathon on December 6th in West Palm Beach, and I chose Miami as my next accomplishment. 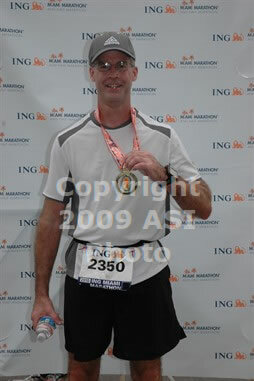 My goal for this race (though a little aggressive) was to chop my past finishing time of 4:10:25 by a full 21 minutes. This was partially because I felt I should have accomplished my goal of 4 hours in West Palm Beach (see that posting for more details on why I didn’t), and also because the past 8 weeks of training have been very productive. This would be the most “mental” race I have yet to experienced. It was a pretty nice day in Miami overall, but was very humid and the air was thick. I knew I wanted to be with the 3:50 pace group and I saw that they were about 30 feet behind me in the coral prior to the start. I didn’t really notice how humid it was until the second mile of the race when I was already pretty sweaty. Around this time it was still dark as we were running past 4 or 5 full size cruise ships in port to the right(south) side of the Macarthur Causeway we were crossing. They were amazingly HUGE and were all lit up. There was also a fire fighting boat below that was shooting up large arches of water using the fire hoses. I will remember that scene for a very long time. I was pleasantly surprised by the amount of people on the streets cheering loudly. 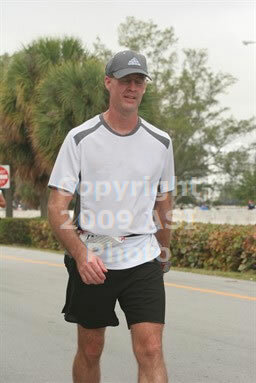 For my first marathon in West Palm Beach there were many on the streets also, but Miami was about double the amount. 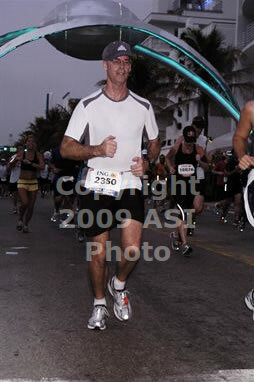 I have driven around Miami a few times, but running the streets without the stifling traffic was amazing. Around mile 10 I had the first feelings this was going to be a painful run toward the end. Even though I was hydrated well, and was in great shape, I was starting to feel a little tired which was not normal this soon for me. Over the first 10 miles there were many times I caught myself running much faster than my goal pace of 8:45. (At times even as fast as 7:10, ouch!) My average pace at this stage of the race was hovering around 8:35, which I knew I would pay for later. At 12.5 miles the half marathon and full marathon split ways so the half marathoners could complete their runs. I must admit the thought of turning with them was tempting. However, I fought out those thoughts and continued on with a renewed feeling of hope now that I had passed that hurdle. The half marathon distance 13.1 miles passed and I noted my speed. 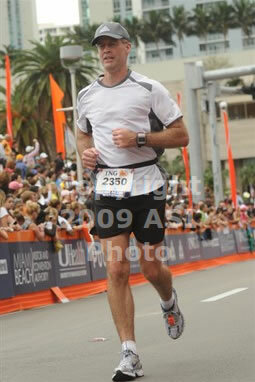 I had just run the first half at an 8:39 pace which gave me a time of 1:53:23. This was faster than I wanted to be, and my mind was really playing with me. I was more tired than any of my training runs at this same pace, for the same distance. I should have only been 1 minute ahead of my desired pace group, but I could not see them anywhere. That gave me a little rush, and helped push me forward. The second half of the marathon carried much less adrenaline, less crowds cheering, less humidity, less runners, and was also on calmer streets instead of the down town scene it was more houses and neighborhood. I did like it, but at this point my feet were starting to feel the pain of the run. I could feel a blister starting on the bottom of my left foot and was forced to stop and re-tie both shoes. It seems that I did not tie them tight enough at the start, and now I would pay for that later also. It was mile 17 when the 3:50 pace group reeled me in, and it was mile 20 when I could no longer hold onto them. In my mind I was fighting and was struggling with the fact that I could not keep up. Meanwhile my body was really dragging. In my training I had been able to keep the same pace, and still felt great at 20 miles, so why was I so tired now? Turning onto Rickenbacker Causeway at mile 22 I was faced with a HUGE bridge that looked to be a 3% half mile uphill grade. I gave an audible groan as I saw people walking up the sidewalk. I was mentally shutting down, and the marathon was beating me. I started walking. (And there happened to be a camera person there to capture it.) There was no way I was gonna quit, but I really needed to get a grip. Then I suddenly realized that the marathoners were not actually climbing the bridge. They were running under it and circling around the other side to return to land. I remember thinking “I can do this! I gotta do this!”, as I started running again. So there I was running again. My feet hurting like they were locked in a squeezing vice as I started to dread every step because it just brought more pain, mentally I was drained and was fighting my instincts with pure will power alone, physically I was ready to drop. However, there was no way I was gonna quit now. I had only 2.2 miles to go and although I had lost the pace group I knew that I could still break 4 hours, which was my original goal for this marathon in the first place. Now that the race is over I am able to look back and realize that there were a few things I could have done a bit differently. 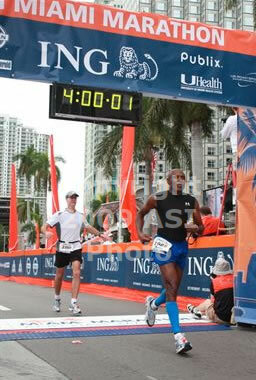 I am very happy with my finishing time even though it was not my goal pace. The fact that I am below the 4 hour mark is a big accomplishment, and gives me a solid base to build from for the rest of 2010. For my own well being, and so I remember, here are a few things that I could have done better. 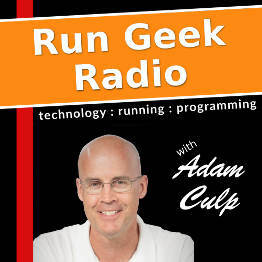 Do not run a 5K race the day prior to a marathon. Normally most people do run a couple of easy miles the day prior to warm up the muscles and loosen. But a race was not a good idea. Perhaps running my long weekend runs too fast caused my stamina to suffer a little for the longer 26.2 miles. I will incorporate a little speed work and hills into my training. While the hills in Miami are small, there were more of them than I am used to and San Francisco will have even more. I should have made a more realistic goal for this marathon. I believe that a 20 minute improvement in a short 8 week time period was a little too aggressive. The 12 minute improvement I actually achieved was significant enough. Great marathon. I was worried when reading that you went out too fast, but you were strong and pulled it off. I haven’t mastered “pulling it off” if I go out too fast. I have to start out slow or at least even paced to finish well. Your improvement is amazing. Congrats! Congratulations on finishing miami. great course, great crowd and a great day! I hate it when race photographers find us walking :P! You did incredible, Adam! I know we discussed the possible culprits to your demise but I truly feel that race conditions just didn’t harvest the ideal race. Yeah, the 5K certainly presented an issue but doubtful it was anything major. You persevered in humid conditions and that is a major feat!!! Congratulations and to your wife, too! I love that picture of you two at the top!! 🙂 Way to go Adam and his wife!!! Congrats to you and your lovely wife! You and your wife are awesome..you should be so proud of all that you have accomplished. Your race report reminded me of a Lance Armstrong book I read a few years ago, It’s Not About the Bike. I am happy to know you.. Funny thing about the amt of people on the course – I compare everything to Chicago and found that the amt of people was a bit less than I expected … and I only did the 1/2 (you said there was less spectators after the turnoff). Anyway, sounds like strong finish despite the wall you definitely hit 😉 Congrats!